Every year, Canucks Autism Network (CAN) invites our volunteers to apply for one of four $500 scholarships to access ACT-Autism Community Training workshops. Applicants are asked to share why they volunteer with CAN and why they want to receive funding for additional autism training. Among the four recipients this year is Kyle Boyle. Since 2015, Kyle has volunteered in CAN’s Overnight Camps, Skate and Hockey programs, as well as at Fundraising Events, Family Events and in the office. After becoming a CAN support worker, he still continued to volunteer in our programs and events. When I was 10 years old, I used to play hockey in my driveway and pretend I was Markus Naslund. When I went to hockey practice on Saturday mornings, I would pretend I was Trevor Linden prepping for a game. As I grew older, I realized not everyone grows up sharing these similar experiences. This is why I began volunteering for Canucks Autism Network (CAN). The most meaningful experiences I have had while volunteering with CAN are found in the small moments. They are in the smiles of the 18 kids stepping onto the ice every Saturday morning. 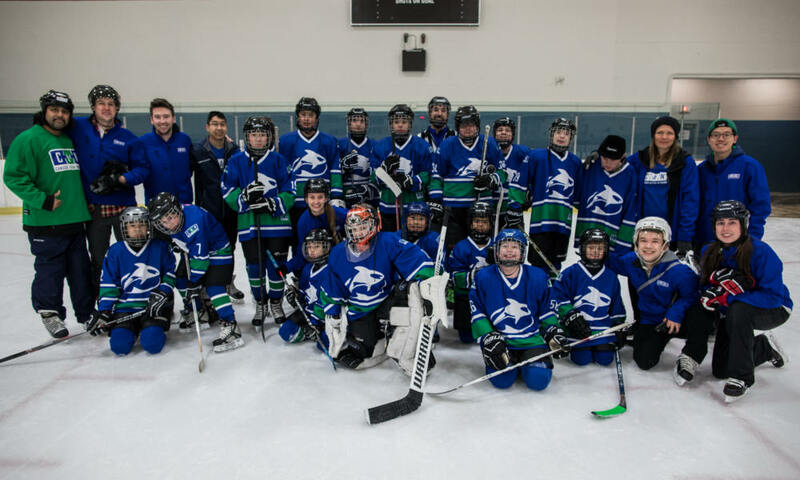 CAN’s Vancouver Orcas at the 2018 Special Hockey Tournament in Kelowna. Kyle in top row, third from left. They are the moments when the fastest, most skilled player on the team stops on a clean breakaway and passes to a player lagging behind so he has the chance to score his first goal. They are in the moments in between plays when you’re learning about your participant’s favourite animal or their fascination with Zambonis. They are in the moments when parents recognize the CAN logo on your jacket while you stand in line for coffee and tell you how much CAN has impacted their family. It’s these small moments that make volunteering for CAN such a special and rewarding experience. From what I can tell, it’s small moments such as these that makes CAN so meaningful for the families too. Earlier this month, I traveled with the Vancouver Orcas (one of CAN’s two adaptive hockey teams) to Kelowna, where they participated in the annual adaptive hockey tournament. When I was a kid, my father would take me to Tim Hortons after every hockey practice for a chocolate croissant and a chocolate milk. (As you can tell, I love chocolate.) Growing up with sisters, I always looked forward to those moments when it was just me and my old man. During the tournament in Kelowna, I had the privilege of having a long conversation with one of the hockey dads. He told me how he shares a similar tradition with his son – Timbits after every CAN practice. His son’s favourite? Chocolate. For me, spending time with my dad was the best part of playing hockey. It is so humbling to be a part of making that experience a possibility for CAN families too. It is amazing to see how CAN impacts families beyond the successes on the ice. Every week at CAN, I get to see the enormous impact that the proper level of support can have on a child with autism. And as a graduate student at UBC, I get to look forward to how my experience at CAN will benefit my future career in health care. Having developed the necessary skills to support children with autism, I hope that I can – at least in part – fill a gap in the healthcare system in BC. Be a missing puzzle piece, if you will. Although I was asked to share my own personal experience volunteering, CAN has never been about the individual. As such, I contacted other members of CAN’s volunteer family and asked them what the bright green Canucks Autism Network volunteer shirt means to them. For me, it’s ensuring that every kid in CAN’s hockey program gets to step on the ice and pretend they’re Bo Horvat or Brock Boeser. It’s helping facilitate the bond between a father and son that hockey can make possible. And for all the participants in CAN programs, I hope that when they see the green volunteer t-shirt, it means that they see a friend. Kyle at Overnight Camp in 2015 — his first experience volunteering with CAN. Learn more about volunteering with CAN at canucksautism.ca/volunteer.